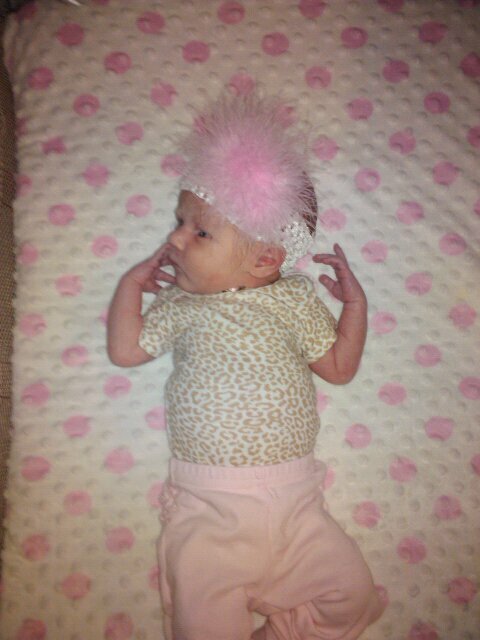 Today McKenna is 2 weeks old and had her second doctor visit. She did great! She is up to 20 1/4in and 7lbs 2oz. 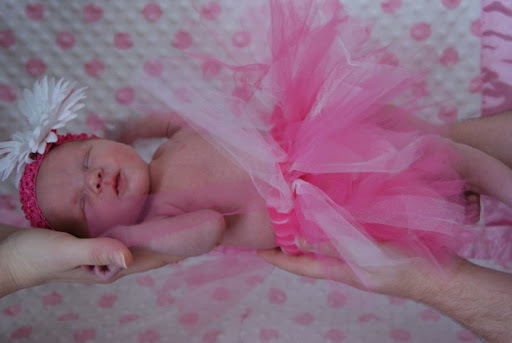 She is in the 10-25 percentile for her height and 50 percentile for her weight. I’m still not really sure what that means. The doctor gave us the official ok to let her sleep as long as she wants during the night, which we have been already. The trouble is she wakes up every 3-4 hours anyway! Oh, well. As long as she gets what she needs, mommy is happy! They had to prick her heel! The state needs blood for something apparently. The first time they pricked it, she didn’t bleed enough so they had to prick her again! She was crying and hurting and there was nothing I could do about it. That made me so sad! I cried too! Cody laughed at me, but I couldn’t help it. That was such a horrible, helpless feeling. I know she was just fine and as soon as they got what they needed and left her alone, she stopped. This motherhood thing is a tough gig! Her umbilical cord is literally hanging on by a thread. It freaked me out! After her last bath there was blood on the towel and her cord looked bloody and gooey. I thought maybe I had rubbed it off too soon or something but apparently that’s normal. So I’m thinking that after her next bath it may just come off. Then I won’t have to worry about it anymore. I’m always afraid I’m going to tug on it or something and hurt her. That’s the last thing I want to do!! She eats great and sleeps great. I love being the one that can calm her down when she’s upset. The fact that once she’s in my arms she stops crying is just awesome to me. That was one thing I was worried about. When it’s other people’s kids that start crying, they go back to mommy or daddy. I don’t know what to do with them. With her, I just know what to do. It’s amazing to me. I’ve really enjoyed my last couple weeks off work. Cody started back at work yesterday afternoon, which is fine with me! He was ready to go back, too. He was getting bored…and he was driving me bonkers. So I am ready for my last 4 weeks all alone with my baby girl! Well, it’s about feeding time again! And little missy had a blowout at the doctors office which led to her peeing all over the place too so SOMEBODY needs a bath! We cleaned her up with baby wipes but she needs a bath today anyway. Well, she’s been here…for a whole week! It has been so crazy I haven’t had time to do this. McKenna is laying in the bed with Daddy while he plays his game, so it seemed like a good time! It started Monday the 9th. I had an appointment at 8:45 HOPING we could induce. We were ready! The doctor wouldn’t do it that day, so we set it up for Wednesday the 11th at 5:00. I didn’t want to go back to work and neither did Cody so we hung out with family for a while. We went to the mall and walked around a little bit hoping that would jump start things. It didn’t seem to do anything! So we thought maybe something spicy for dinner would do the trick. It didn’t really seem to have any effect either. So we tried…well…another thing that’s supposed to get it going. I don’t know if it was the latter, a combination of the three, or just coincidence, but contractions started around 9:30 Monday night. I wasn’t sure that’s what it really was but about 3 hours later, it was still happening and the pain was stronger so to the hospital we went! Cody and I took our car with all of the stuff in it and my mom and Randy followed behind. They kept me in triage monitoring my contractions for about 5 hours before they admitted me to a room. I hadn’t progressed much but I suppose they realized sending me home wasn’t an option. I was in too much pain! Poor Cody, mom, and Randy! They sat up all night! I’m so lucky to have such a wonderful support system. I got the epidural somewhere between 7 and 8 and oh boy was that nice!!! They gave me a little pitocin just to keep things going. The doctor came in and broke my water around 9. So there we sat until 1:30 or so. Then it was time to push! I pushed for a little over 30 minutes and she was born at 2:08pm. She was 6lbs 7oz and 19.5in. We got to go home the next day around 3 and have been having so much fun ever since! It’s been an adjustment for everyone, though! She’s supposed to eat every 3 hours so that’s fun waking up that much! Other than one rough night, she’s done great! She sleeps a lot, eats, dirties up diapers, and goes back to sleep. I’m sure this will change at some point, but she doesn’t really cry that much. She’s a super good baby! We love her so much! It’s amazing to look into her eyes as she’s looking back into mine. She has changed so much in the last week already. Cody says she’s grown an inch, but I’m not convinced. Yesterday was our first day alone as a little family and that was fun! We went to Babies R Us to get more bottles. She slept the whole time. It’s been nice having my mom here too. She’s been a lot of help. I’ve not ever really been around babies, so I’m learning! The first trip to the pediatrician went well. She told us we had a perfect little baby girl, which we already knew! I’ve lost 16 of the 27 lbs I gained while pregnant. I’m in the awkward stage between maternity and regular clothes. I’m not really enjoying that. Other than that, my recovery has gone very well. I didn’t tear at all so it’s been pretty easy for me physically. I get tired, but that’s about it! Cody seems to want to go somewhere every day and I am content to stay home, so that’s a little frustrating. I love having him here and love the help that he is, but I’m looking forward to being by myself too. I just want to stay home with my baby and he gets cabin fever when he’s been home for like 5 minutes. This is particularly frustrating today, but oh well. He promised we could stay home tomorrow. I’m just happy she’s here! I know that was a long one this time, but there was a lot to catch up on! This is taking tooo looong!!! I’m ready for my baby girl to be here! We have an appointment Monday morning at 8:45 and I am reallyyyy hoping we’ll be inducing that day. There isn’t really a good reason not to. She’s been moving around a lot still, even though she doesn’t have as much room! I’ve been feeling sick and I think it’s probably because she’s got body parts all up in my stomach and there isn’t room for the food I’m putting in it. As I type this I am fighting the urge to go vomit. Sorry, TMI I’m sure! I’m exhausted all the time!! My right foot only is swollen and sore. When she gets this hiccups I can look down at my tummy and see it jumping. It cracks me up every time! I’ll miss that! It’s just time…I feel like she’s trying, though. I keep having contractions but nothing consistent. They have been getting more painful, but like I said, not consistent so I know it’s not quite time yet. I was at 2cm this past Monday, so maybe the contractions have made progress in that department. I sure hope so. She is about the size of a leek this week. Lol…that rhymed! Sorry…I’m delirious!